While many traps are triggered by proximity, others have a physical trigger of some kind. With caution, traps can be circumvented by avoiding the trigger. Traps can also be used against enemies by activating these triggers at the right time. Description: A yellow, claw-shaped lever placed on the wall. Effect: When the lever is pulled, the trap linked to the claw lever will be set off. Notes: A claw lever resets in a few seconds after it is pulled. Whether it has any effect to pull it again depends on the trap linked to it. This trigger is usually tied to either a citadel guillotine blade or a citadel trident blade. Description: Pressure plates come in two forms: a round metal plate or a large white slab placed on the ground. The plate will make a sound when it is set off. Effect: When sufficient weight is applied to the pressure plate, its associated trap will activate. The trap can be triggered from a distance by firing an arrow at the plate or by placing an item on the plate (for example, using Telekinesis). Notes: Except for a few rare cases, pressure plates only activate once; standing on the plate a second time has no effect. Like the tripwire, the pressure plate is most commonly tied to traps with falling objects, such as a swinging mace. Description: A wire is visible at ankle height, stretched between two wooden poles that are embedded in the ground and cannot be moved. A snapping sound is heard when the wire breaks. Effect: When a creature or object passes through the string, the wire breaks and the trap linked to the tripwire will be set off. Tripwires are usually set in narrow passages to maximize the effectiveness of a linked trap. The wire can also be broken from a distance by firing an arrow into one of the poles. If you are close enough, you can break the tripwire by activating it. Like the pressure plate, the tripwire is most commonly tied to traps with falling objects, such as falling logs. Physical traps usually damage their victims and push them backwards. The damage cannot be reflected, absorbed, or resisted by magical means. The only way to reduce it is the Resist Normal Weapons effect. The damage dealt by physical traps is leveled, and is calculated for each actor individually by using its own level. The amount of damage dealt is not affected by the difficulty slider. As with trigger traps, physical traps can be used to a player's advantage to kill groups of enemies. 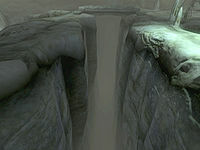 Description: You can distinguish an abyss from a regular chasm by looking down. An abyss ends in total darkness, and is usually covered by fog. It is also shown in dark grey on the area map. Effect: An abyss can work in combination with another trap, usually an untrustworthy bridge. Falling down into the abyss causes instant death for whomever falls into it. There is no way to survive the abyss because the death is scripted. 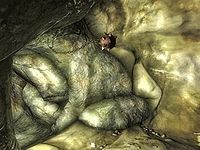 Essential NPCs are not killed if they fall into the abyss, but they will fall unconscious and recover again in perpetuity. The abyss is quite rare, only appearing in a small number of locations, and is one of the few elements in the game that can instantly kill you if you come into contact with it. Description: Look for light brown rocks lying on the top of a nearby hill. When the trap is set off, a rumbling sound will be heard and the screen will shake. Effect: When the player comes in close proximity to an avalanche trap, several rocks will come rolling down a nearby hill. Anyone hit by rocks will receive 10 points of damage. Notes: The boulders will only be released once, but they will remain on the ground and can be moved by area of effect spells. The avalanche is frequently set off before you have time to reach it. Even if you are caught in an avalanche, you can easily sidestep the falling boulders. Description: Spike pits are disguised as lightly-tinted sections of floor patterned with a grid of small holes. Effect: When stepped on, the floor will descend onto spikes that shoot up through the holes in the platform. Anyone struck by spikes will receive 15 + 1.5 × level damage. When an actor triggers the trap, it will only take damage if it actually falls into the pit. The floor will lower even if no physical contact occurs, so jumping over the trap does not help. When the trap activates, move near the edge of the platform to avoid the spikes. After this trap has reset, it will take five seconds to re-arm. If anything dies above the trap, its corpse will keep activating the trap until the body vanishes. 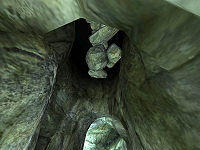 Description: Loose rocks can be seen on the ceiling. When a cave in is triggered, the screen shakes and a rumbling sound is heard. Effect: Rocks will fall, damaging anyone beneath them. Anyone hit by a falling rock will receive 5 + level damage. Notes: The rocks will only be released once, but they will remain on the ground, possibly covering other objects. The rocks will still do damage if they move fast enough, so be careful when firing area of effect spells at them. Cave ins often occur in dead-end passages. These passages can be identified by loose rocks lying on the floor at the end. 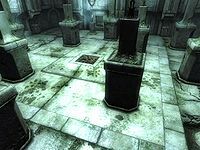 Description: A lightly tinted platform on the ground covered in bloodstains will give this trap away. A large, square-shaped gap in the ceiling will be present above the platform. Spikes may be visible within the gap. Effect: When the platform is stepped on, the floor will rise to meet the spikes protruding from the ceiling, damaging anyone who comes into contact with the spikes. Anyone hit by spikes will receive 15 + 1.5 × level damage. The floor will only rise when an actor physically stands on it, so it is safe to jump over the trigger zone. It is possible to stand on the corner or sides of the rising platform in order to avoid the spikes. After this trap has reset, it will take five seconds to re-arm. Like the spike pit trap, anything that dies on this trap will cause it to continually reset and re-trigger until the body disappears. Description: The guillotine is a huge blade perpendicular to the hallway, with yellow edges mounted on the ceiling. Unusual grooves, creases, or gaps can be found in the wall. Effect: When triggered, the blade will quickly descend. When the blade reaches the ground, the screen will shake and a loud crashing sound will follow. The blade will stay down for a few seconds, and then slowly rise up again. Being struck by the blade causes 20 + 1.5 × level damage. The citadel guillotine blade can be avoided by quickly running through the target area before the blade falls. You can also trigger the blade and step back, passing under after the blade has retracted. It is also possible to jump over the blade, though more precise timing is needed with this method. This trap can also be triggered by a claw lever. Be careful, as even walking into the side of the blade can cause damage. Description: Vertical rows of holes will be visible in the walls. Effect: When triggered, spikes fly out of the holes, causing 20 + 1.5 × level damage. Citadel spikes are located on the walls of Citadels and are easily spotted, making them less dangerous than some other traps. If you run directly through the target area, you will escape the damage zone before the spears can fully extend. Alternatively, it is possible to trigger the spears, step backward, and wait for them to retract back into the wall. After this trap has reset, it will take five seconds to re-arm. 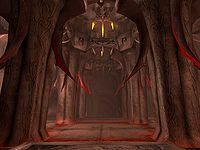 Description: You can see a large, claw-like mechanism in the ceiling, usually near the entrance of a wide hall. Effect: When triggered, the blade silently swings down from the ceiling towards the player. Being struck by the swinging blade will cause 25 + 1.5 × level damage. Notes: The blade will only be released a single time, but it will still do damage if you run into it. This trap is difficult to dodge because it gives so little indication that it has been triggered. Dodge it by stepping to either side when you see the blade coming towards you. This trap can also be triggered by a claw lever. Description: Small curved bone spikes bend vertically on both sides of a path. 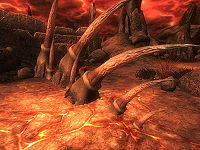 Effect: When triggered, bone claws will protrude from the ground. This trap's main purpose is to block movement, although being only about ten feet in width, it is not particularly effective. The spikes do no damage. Claw traps are fairly easy to avoid. The claws will remain above ground for 19 seconds, then retract. The trap will re-arm after five seconds. 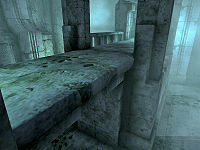 Description: A crumbling bridge trap consists of a small section of a bridge that is rigged to give way as you pass over it. Sections of the bridge that are rigged to crumble will have a slightly lighter color than normal material. The bridge may also have small spike-like protrusions. 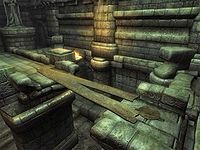 Effect: When you step on the trapped section, it will crumble and part of the bridge will fall. Anyone standing on a section that is trapped will fall along with the broken bridge. They may also be damaged, depending on the height of the bridge. Notes: The bridge will remain damaged after it has crumbled and it will be harder to maneuver over the bridge. While this trap is not particularly dangerous, it can make progress bothersome. If you fall down, you will be forced to retrace your steps in order to return to the bridge. It is possible to trigger the collapse so that it occurs before you are entirely on the trapped section of bridge, thereby avoiding damage. 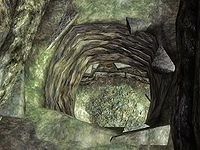 This trap may be combined with another trap, such as a dart trap mounted on the pillars below the bridge, which will cause you to fall down into the path of the darts. Description: Look for a series of holes mounted on a wall. Effect: When triggered, darts will fire out of the holes in the wall. Being hit by a dart will cause 5 + 1 × level damage per second. This trap is fairly dangerous. It is possible to avoid the darts by stepping into trigger range, stepping back to avoid the trap, and running past once the trap has stopped firing. There is a five-second delay between firings. Although each individual dart is weak, the combined damage of a multitude of darts can be quite damaging. It is not uncommon to find dart traps combined with other traps, such as a crumbling bridge that drops the player into the trigger range of a darts trap. 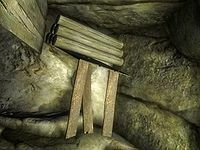 Some dart traps, like those found in Fort Farragut, fire indefinitely, making it impossible to pass them unharmed. 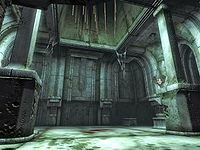 Description: Look for large, rusted blades suspended by metal hanging from the ceiling. Effect: When triggered, the blade will fall. Anyone touched by a falling blade will receive 20 + 1.5 × level damage. Falling blades are moderately dangerous, as they deal a fair amount of damage, but they are easily spotted. You can avoid falling blades by either triggering the blade and jumping over it while it remains on the ground or by triggering the blade and waiting for it to reset. After this trap has reset, it will take five seconds to re-arm. Be careful not to touch the blade while it is moving, as even the side of the blade will cause damage. Description: Look for a stack of wooden logs, often situated at the top of an incline or drop. Effect: When triggered, the logs will be released, tumbling down the ramp or over a cliff. Each log will cause 30 + 1.5 × level damage. 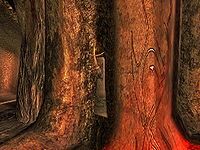 Notes: The logs will only be released once, but they will remain on the ground and can hinder your passage. Be careful when grabbing them or moving them with area of effect spells, as they will still do damage if moved fast enough. Falling logs can be either triggered (with a tripwire or other trigger) or activated from a close range. Falling logs are dangerous, as the damage dealt by a successful hit is large. However, they are easily avoidable, and can even be used against unsuspecting enemies. Description: Watch for small, floor-mounted squares or large gratings. Effect: When triggered, a poisonous gas is released that will cause damage within a small radius. Anyone within the gas clouds will receive 2 + 0.125 × level damage per second. The damage dealt by gas traps is minimal, but the trap is difficult to avoid. Most gas traps require a trigger to activate, but some are constantly active. Poison resistance negates the effects of this trap. 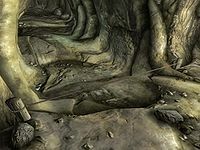 Argonians are immune to poison because of their racial trait, which grants them immunity to gas traps. 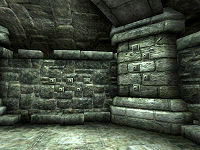 Description: Look for an open room with multiple pillars and a grate in the middle. A large indentation forming a square will also be visible around the perimeter of the trap. 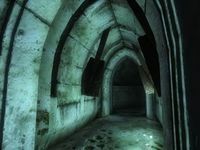 Effect: When you enter the center of a gas room, walls will rise up around the pillars, trapping you inside. Shortly after, poisonous gas will begin to flood the room. The walls will lower after eight seconds. The gas will cause 2 + 0.125 × level damage per second. Additionally, gas in Oblivion will damage your Speed attribute. There are usually items of value placed within gas rooms to lure you into the trap. Some gas rooms require the activation of a button in order to lower the walls and escape the trap. Poison resistance negates the effects of this trap. 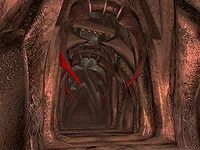 Argonians are immune to gas rooms because of their racial trait, which grants them immunity to poison. A good way to avoid this trap is to go into a corner and crouch to avoid the gas. Some gas room traps may not function properly; see bugs for details. Description: Look for a plank used as a bridge to cross a gap. If you stand below a rotten plank, you can see the sections that can break. Effect: When stepped on, a rotten plank will break. Anyone standing on a rotten plank will fall while it is activated. Damage may be received depending on how far you fall. Notes: The plank will remain damaged, making it more difficult to maneuver over the gap. It is difficult to discern rotten planks from ordinary planks, so it may be wise to avoid walking over planks altogether, jumping across any gaps spanned by planks instead. If a gap is too large to jump, running quickly over planks may help you avoid falling if one should break beneath you. 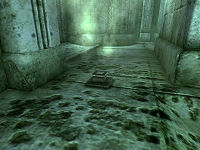 Description: Look for holes in the bottom of corridor floors. Areas below spike pits are populated with sharp spikes. Spike pits in Planes of Oblivion may be situated over lava. Spike pits may be covered by unstable gratings. Effect: If you are not careful to avoid the hole, you will fall through it. Falling into the trap causes 10 + 1.5 × level damage. You may still be damaged even if the pit contains no spikes, depending how far you fall. If you fall through a hole resting over lava, lava damage will be applied. Notes: The trap is passive and will always remain a hindrance to you. To avoid spike trips, it is best to walk carefully when passing through small corridors. If you spot a hole, simply jump over it. 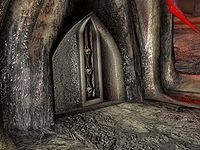 Be careful, though, as you may hit the ceiling of the passageway, which may greatly cut your jump short and send you headlong into the pit despite your attempt to avoid it. If you fall through an ordinary hole or a hole resting over spikes, you will likely take damage and be required to retrace your steps in order to reach the corridor again. 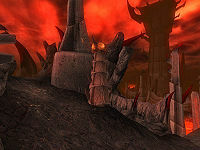 However, if you fall through a hole situated over lava, you will most likely die, as there are usually no escape routes from the lava chambers. 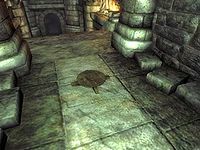 Activation of these traps target you specifically; NPCs and creatures will not cause gratings over spike pits to fall when they step on them. Description: Look for a grating with spikes welded onto it at the end of a hallway or long span. Once triggered, spiked barriers emit rattling sounds. Effect: When triggered, the spiked barrier will sweep back and forth. Anyone hit by the spiked barrier will be pushed away and will receive 20 + 1.5 × level damage. Spiked barriers are triggered by proximity and will sweep quickly across their platform. Attempting to cross its threshold during a sweep is inadvisable, as spiked barriers move quickly and are difficult to dodge. Avoiding a spiked barrier requires you to trigger it first and wait for it to reset, at which point you may rush past it. 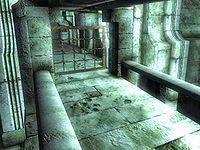 In addition, there are often small balconies or stone railings along the bridge or hallway of the trap; jumping on these will usually allow you to dodge around the trap and continue in the barrier's wake. Enemies may also be lured into the path of the spiked barrier. Description: Look for vertical slits that arch around corridor walls. After activation, swinging blades make loud, sweeping sounds with each swing. They may get "stuck" in the walls and stop swinging for a moment. Effect: When triggered, multiple large blades will swing from side to side across the passageway. This will continue until you have moved far enough away from the swinging blades. Being struck by one of the blades causes 20 + 1.5 × level damage. Triggering a swinging blade trap is unavoidable, but the blades can be dodged rather easily. Swinging blades move both dependently and independently from each other, and their timing is varied. There is a large enough space between each blade to stand without fear of being struck. After the trap has been triggered, watch the pattern of the blades and pass at intervals in which there is no blade movement. Alternatively, you may opt to dash across a swinging blade trap in one motion, but you take a much greater risk of being hit by a blade in doing so. If you are a Journeyman in Acrobatics, you can easily avoid the swinging blades by using the Dodge ability. 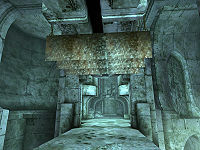 Description: You will see a large log suspended by chains that are attached to the ceiling. Effect: When triggered, the log will be released, swinging downward. Being hit by the log causes 15 + 1.5 × level damage. Notes: Although the log will only be released once, it may still do damage if you move it enough by grabbing it or firing area of effect spells at it. Swinging logs are usually placed to strike an area a few feet in front of their trigger. More often than not, swinging logs are triggered by tripwires or pressure plates, both of which emit loud, noticeable sounds. If you wish to avoid swinging logs, you should stand still after hearing one of these sounds. The trap will most likely strike the area directly in front of you, leaving you unharmed. If you have good aim, you can use the grab function to stop the log and gently let go of it; you can even use the log against other enemies by pulling it up and releasing the log. Description: Look for metal or wooden maces suspended by chains that are attached to the ceiling. Effect: When triggered, the mace will be released, swinging downward. Depending on the variety, the mace will either deal 10 + 1.5 × level damage or 20 + 1.5 × level damage. Notes: Although the mace will only be released once, it may still do damage if you move it enough by grabbing it or firing area of effect spells at it. Swinging maces are usually placed to strike an area a few feet in front of their trigger. More often than not, swinging maces are triggered by tripwires or pressure plates, both of which emit loud, noticeable sounds. If you wish to avoid swinging maces, you should stand still after hearing one of these sounds. The trap will most likely strike the area directly in front of you, leaving you unharmed. There are two varieties of swinging mace: the first is a small, ball-shaped mace and the second is a larger, cylinder-shaped mace. If you have good aim, you can use the grab function to stop the mace while it is swinging and gently let go of it; you can even use the mace against other enemies by pulling it up and releasing the mace. Metal maces can be prematurely activated by firing arrows at them, but this does not work for wooden maces. Some swinging maces are located above thrones in abandoned forts, and will be triggered when you sit on the throne. Magical traps fire spells at their victims. Depending on the spell cast, the effect can be absorbed, reflected, or resisted through magical means. Unlike physical traps, magical traps always aim directly at you, rather than at a fixed location. Magical traps will always "see" you, regardless of any Chameleon or Invisibility effects you may have. 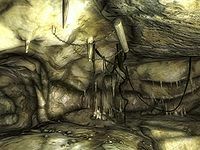 Description: These traps look like dark crystals set in pillars. Effect: When you are within range, the stone will charge and fire a frost damage or shock damage spell on target (see table for damage). 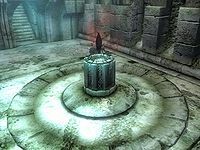 When you move into range, the dark Welkynd Stone will begin to charge and glow red, warning that it is about to fire. Some stones will power down if you stop moving; some will only power down if you move back out of its range. The spell fired by the dark Welkynd Stone can be absorbed and resisted, but it cannot be reflected. 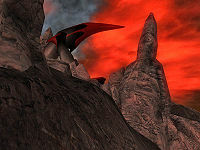 Description: Look for large pillars with claw-like mechanisms at the top. Effect: When you come within range, the top of the tower will begin to spin. If you remain within range, the fire turret will shoot a fire damage spell at you (see table for damage). The fire turret's spell can be dodged easily enough, but at higher levels the fireballs will have an area of effect, making it much harder to avoid. The trajectory of the turret's fireball, like other projectiles, may be thrown off by quickly changing directions as the spell is fired. If done correctly, the fireball should miss you. The tower will not fire if you are too close to it. 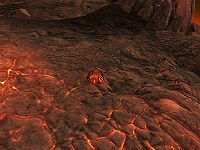 A fire turret will only target you specifically; it will not target NPCs or other creatures. However, it is possible for the fireball to hit someone else, including one of your enemies, if they are between you and the tower. The fire spell from the turret can be absorbed and resisted, but it cannot be reflected. 25+ No spell fired (see Bugs). Description: This trap appears in the form of small, claw-like mechanisms embedded in the ground. Effect: When triggered by proximity, the land mine will eject from the ground and spin upwards to about the height of your chest, at which point it will explode and launch a fireball at you. When triggered by a projectile, the land mine will detonate on the spot. The trap casts a fire damage spell on target (see table for damage). Notes: The mine will only explode once. If you spot a land mine before it activates, you can disarm it remotely by firing a projectile weapon or ranged damage spell at it from a safe distance. The mine will still explode, so be prepared to avoid the fireball heading towards you. If you trigger a land mine by proximity, either hit it with a weapon, causing it to shatter harmlessly, or quickly get out of range before the land mine has a chance to detonate. It will lower and not explode, allowing you to trigger it at a range. If you cannot be targeted properly, the land mine may simply explode instead of shooting a fireball. Land mines are highly sensitive, and can be activated by debris from nearby exploded mines. Sometimes a chain reaction is caused by the detonation of a single mine. Unlike the other magical traps, the fire spell from the land mine cannot be absorbed or reflected, but it can be resisted. After reaching level 25, the mine will detonate but it will fire no spell at all. It is possible to make the land mine instantly disappear by making a proper maneuver: first, come close enough to the mine to trigger the "jump", then move away; wait for the mine to be half-way to the ground, and then once again come close to it. The mine will disappear the instant it casts the spell (unless you are level 25 or higher and do not have the UOP installed, in which case the mine will just disappear). 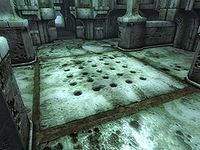 The gas room trap in Narfinsel does not expel any poisonous gas. If you stand on the walls when the gas room trap is activated, they will smash you through the roof. You can then walk around over the roof and see through various walls and ceilings. To return to the normal interior, jump into the void and the game will automatically teleport you back. You will also go back into the normal interior if you are standing on the walls when they lower. This page was last modified on 27 January 2018, at 23:25.